Sarah Gill is a Senior Reporter at our partner publication, StrategyEye Digital IQ, whose unique subscription service tracks global technology, media and telecoms markets, with a particular focus on startups and disruptive tech trends. Click here to find out more. StrategyEye events are free to subscribers (with tickets available to purchase for non-subscribers) and are designed to enable attendees to network and share ideas. As seats are very limited, our subscribers are given priority to attend. Up next is ‘The Future Of Music’ on May 27th – if you are interested in attending or sponsoring, stay tuned for details and contact Harry at events@strategyeye.com for more information. If ticket sales and the empty bottle count from our latest ‘tech talk and networking’ event are anything to go by, payments continues to be one of the hottest segments of the tech industry right now. Apple Pay may have propelled payments into the spotlight last year, but the digitalisation of everyday transactions for consumers and businesses is a revolution that’s been a long time coming. After a lot of false starts, today the payments industry is at one of the most exciting points in its evolution. Last night more than 130 people packed out The Escalator space in East London to hear from industry disruptors at the cutting edge of payments and fresh startups looking to make their mark on the space. StrategyEye kicked things off with a snapshot of investment trends in the payments and wider fintech market to set the scene. Key players, Stripe, Klarna, iZettle and Adyen then all shared insights on growth, challenges and the hottest trends shaping the industry, followed by rapid-fire pitches from startups FlyPay and Safello. We’d also like to thank our sponsor Payment Gateway for keeping the networking well fuelled with pizza and drinks. StrategyEye’s own head of editorial and analysis Tom O’Meara got the evening started with an overview of where the money’s headed in digital payments. According to StrategyEye data, there was more than USD1.5bn in venture capital investment in payment startups last year – compared to USD637m a year earlier. “What’s interesting however is if you take bitcoin away, bigger bets on bitcoin companies (21 Inc – USD116m and Coinbase – USD75m) in this year inflated the investment figure in the last quarter. 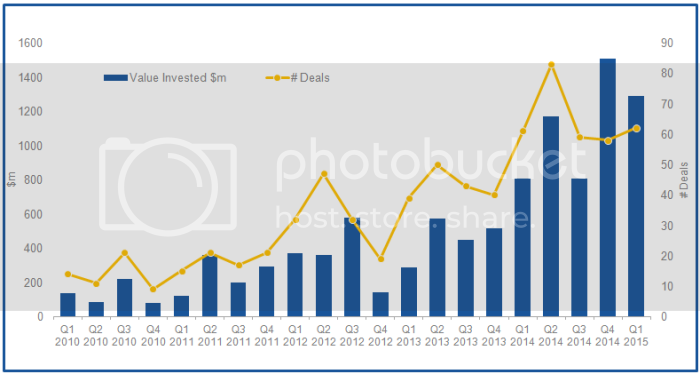 Without bitcoin investment was USD160m this quarter compared to USD227m in Q1 2014. Next up, Klarna’s head of expansion Jens Saltin talked about the challenges of getting customers to complete purchases on mobile and how the firm’s simple check-out tool is helping to change this. He touts the importance of design, simplicity and building with the user in mind. “At Klarna we think there is a big myth out there that says mobile is for browsing, desktop is for purchasing. We think people will buy on mobile if we let them,” says Saltin. Stripe is one of the hottest players in the space right now. James Allgrove, head of business development and operations outlined Stripe’s solution for making it easy for merchants to accept digital payments from anyone, anywhere. As well as removing a lot of the time-consuming and complicated administrative headaches for merchants, Stripe is also catering to the increasingly-complicated business models of online businesses. Examples include subscription sites and marketplaces such as Task Rabbit, which need dynamic payment flows. Our second Swedish fintech business of the night, iZettle is Europe’s answer to Square and the region’s biggest mobile payments player. EVP Stewart Roberts took to the stage next, talking mobile payments, acceptance and hype versus reality of changing payments behaviour. Echoing Klarna, he says design, simplicity and experience are key. “When you’ve been in the space a long time, however fast people want it to move, it does not move that quickly,” says Roberts. The payments space isn’t just fragmented in terms of competing startups and systems, but on a global scale there are regional differences that makes expansion a tricky obstacle course for merchants. With an emphasis of internationalising the Adyen’s head of UK account management Ian Campbell highlighted the how the company helps companies scale. “Three factors when we talk about the future of payments: internationalisation, or more sincerely – localisation. If you’re going to go international you need to stay local. The second thing is about optimisation of authorisation rates, and the third is mobile,” Says Campbell. Making it easier to split bills, pay at the bar and place for orders, Flypay builds tech for the hospitality industry. Co-founder and CEO Tom Weaver talked us through how the company is disrupting the restaurant space. Safello aims to establish itself as Europe’s simplest and most secure bitcoin exchange. CEO and co-founder Frank Schuil talked about the firm’s goal to solve financial exclusion with bitcoin. Safello was our third Swedish company of the night – highlighting the influence entrepreneurs from the Nordic region are having on Europe’s fintech space. Look out for this trend in our forthcoming Future Of Payments report. Ralf Ohlhausen, Business Development Director, PPRO at Money 20/20 EU, Amsterdam, discusses the rise of local and alternative payment methods and the evolution of PSD2. The piece encourages onlookers to think about the current crypto hype in a new way. How can financial services effectively and innovatively leverage consumer data to provide solutions beyond the merely convenient to create something truly revolutionary?